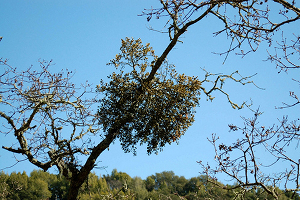 Mistletoe grows on the branch of an oak tree in Briones Regional Park. Photo: kqedquest. Have you been hanging out under the mistletoe at holiday parties, hoping for a kiss? Well, that mistletoe is more than a Christmas kissing custom. It’s a parasite that can harm trees—and a potential treatment for cancer. Mistletoe lives on the branches of trees, and is a hemi-parasite; it produces some of its own food (it has green, photosynthetic leaves), but it gets nutrients and water from its host plant (its roots tap into the host plant, rather than the soil). If the mistletoe grows big enough, they can do some damage. Large mistletoe plants can weigh down tree branches and make them more likely to break off during a storm. If there are many mistletoe plants in a single tree, they can stunt the tree’s growth, make it more susceptible to disease, and even kill it. There are several species of mistletoe living in California. Pacific mistletoe, Phoradendron villosum, lives in the western US, and is a parasite on oak trees. European mistletoe, Viscum album, parasitizes a wide range of species, including apple trees and maples. Mistletoe is spread from tree to tree by birds. They eat the white berries and spread the sticky seeds with their beaks or in their excrement. Despite its parasitic tendencies, mistletoe has long been thought to have healing powers. In Greek legends and druid folklore, mistletoe was used to treat disease. And since the 1920s, scientists have been investigating mistletoe extract as potential cancer drug. Several laboratory studies have shown that mistletoe extract can kill cancer cells—though other studies have shown that the extract has no effect. It seems that mistletoe growing on different types of trees (like apple, pine, oak, or elm) may have different medicinal properties. Mistletoe extract seems to boost the immune system, by increasing the production and activity of white blood cells. (Don’t try this at home—mistletoe can be poisonous.) Several clinical trials, mostly in Europe, have tested mistletoe extract as a form of adjuvant therapy—a treatment that is given to cancer patients after their primary treatment, to decrease the risk that cancer will return. Patients were treated with mistletoe extract (injected under the skin), along with radiation and chemotherapy. Patience who received the mistletoe extract fared better than their counterparts who did not receive it. Additional studies are underway: check out the National Cancer Institute’s Questions and Answers About Mistletoe. While you’re standing awkwardly under the mistletoe at your next cocktail party, you can wait quietly for that special someone, or you can strike up a conversation about mistletoe’s medicinal properties. Pregnant women should not use mistletoe as mistletoe causes miscarriages.